I’ve been making smoothies a lot this summer! I kind of got into the habit when I was working out with a trainer who always urged me to eat some protein right away after each killer session. Once it got so hot, I started going to a nearby smoothie place and ordering a fruity drink with protein added. Well, that gets expensive, and they really weren’t all that healthy for me. I mean, compared to a Snickers Blizzard, they were amazing, but as I’ve been becoming more health conscious, I couldn’t justify the sherbet and yogurt. (I mean, is it frozen yogurt? Is it non-fat or full fat? How do I really know what’s in them to make them so yummy?) I’ve been trying to do less dairy and more organic, especially with berries. So, I decided it was time to buy a blender and start making my own. I got online and started researching blenders. So, back to the smoothy place I went. But I launched out and started getting the yummy chocolate and peanut butter drink. OHMYGOODNESS was it ever delicious! How could I ever go back to plain old fruit now?! Besides, peanut butter had lots of protein, and I was even adding extra protein. This had to be waaaay better than a fruit smoothy anyway! It doesn’t take long to start chubbing out when you get a giant choco-peanut smoothy after every workout! This was an expensive habit in more ways than one! I decided it was time to give up the VitaMix dream and just go get a blender already! I bought a gorgeous charcoal colored KitchenAid blender at Target, took it home and made my first smoothy – of course with yogurt, peanut butter powder and Hershey’s chocolate syrup! Thankfully it tasted awful and I vowed to never do that again! My first few attempts at smoothies were pretty dismal. I was relieved to not have spent the big bucks on a VitaMix. I didn’t know how I’d justify owning the Bentley of blenders as I watched it collect dust on the counter! I looked up smoothy recipes on Pinterest and found one that sounded good. 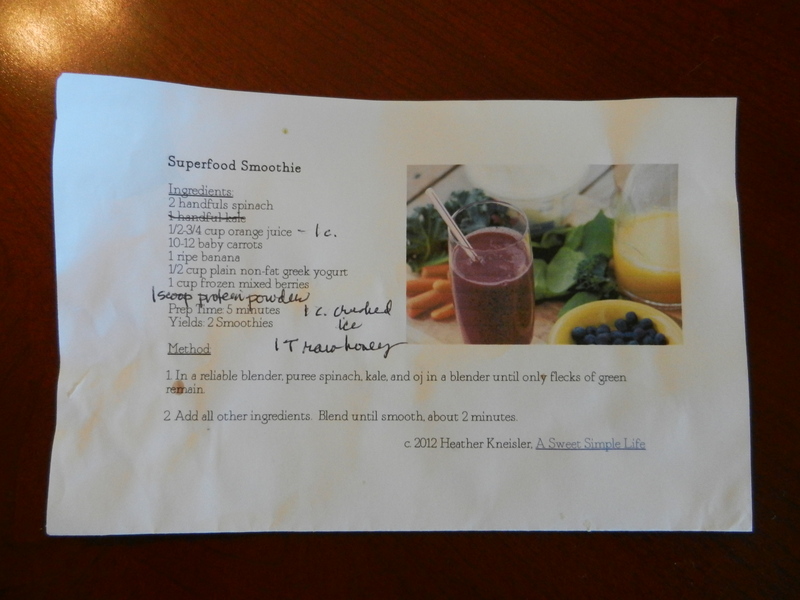 The “Superfood Smoothy” by Heather Kneisler. I’ve made some adjustments to it, and I’m satisfied that I’ve made the switch from expensive fast-food smoothies to homemade, delicious, nutritious ones! Now I’m getting more fruits and vegetables and cutting back on the sugar and extra calories I really don’t need! I mean, I never ate veggies in the morning! I feel healthier each sip I take! 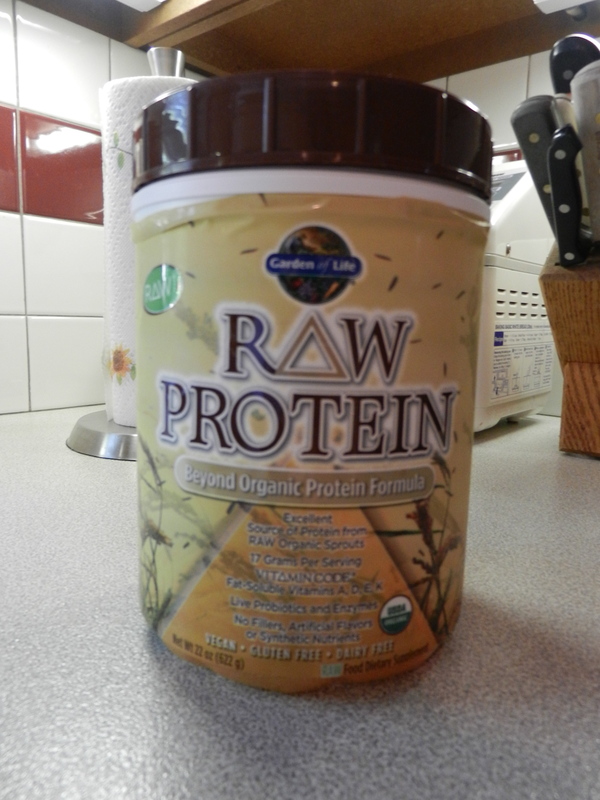 Oh, and I found some protein powder that I really like. I don’t do soy protein powder (which is in nearly everything!) because I’m a breast-cancer survivor (estrogen-driven type) and soy mimics estrogen in the body. Whey is supposed to be a good alternative, but it’s a by-product of cheese production and I’m trying to do less dairy . . . so when I came across this at Whole Foods the other day, I had to read the label and make sure it wasn’t too good to be true! It’s incredible! This protein powder is made from sprouts – and they are all organic! Brown rice, amaranth, quinoa, millet, buckwheat, garbanzo bean, lentil, flax, and so on. It wasn’t cheap, but no protein powder I’ve seen is. It also has live probiotics and enzymes, no fillers or synthetic nutrients and the best part is that it doesn’t make my smoothy taste funky. And, let’s be real here, if it doesn’t taste good, it doesn’t matter how nutritious it is, I’m not going to eat it more than once! In a reliable blender, puree spinach and orange juice until only small flecks of green remain. Add carrots and chop, then puree until tiny flecks of orange remain. Add all other ingredients. Blend until smooth. Drink and enjoy feeding your body the nutrients it craves! When I started this blog 19 months ago, I didn’t know Nick Ryan. But as I began my quest for fitness and health, he became my trainer and eventually my friend. Two and a half weeks ago he and some friends were hiking up in Montana. As their yearly trips went, this was not even dangerous, yet his amazing life was cut short from a fall. I’m still trying to wrap my mind around this. It’s one of those inexplicable tragedies in life that seem so absolutely wrong. Over the last few days, my husband and I have been watching Shark Week on Discovery Channel. The people in these shows are risking life and limb, literally, to film, and yet aren’t killed by their serious risk-taking choices. Nick, on the other hand, was just out with his friends hiking one minute and gone the next. I’ve wrestled with God and asked questions about the seeming lack of fairness of it all, yet have to quiet my heart, and say, “You are God and hold our lives and times in your hands.” My heart aches, not only for my loss, but for Nick’s wife and two little girls who have lost a terrific man, husband and father. I first met Nick in January of 2010. A friend of mine had begun working out at Fitness Together in October 2009, and I saw such changes in her that it gave me my first glimmer of hope in nearly six years. Dieting and exercise didn’t effect much change for me and I lost hope that my body could ever become strong and active. My heart was damaged by the chemotherapy and my lungs were damaged from the pneumonia. My balance was off for 7 long months from some unexplained inner ear malady that left me unable to drive or look at any movement without feeling severe nausea. My upper body lacked physical strength from lack of use, but also from my chest muscles being “messed with” due to my radical bilateral mastectomy. I was in terrible shape and I felt old and worn out and weary. That’s the Kris Beauchamp that walked into Fitness Together seeking help in January 2010. Although looking back, I was hoping for a miracle but Nick wasn’t going to promise me one! I was hoping I could get in and outta there in 2 or 3 months. He was gracious not to laugh or roll his eyes, but he told me realistically that it was going to be a longer commitment than that. I remember feeling embarrassed and ashamed of my fat body and horrified that he had to weigh and measure me. If it hadn’t been for my friend’s success I might never have gone back after those numbers were written down! I’d go in, very quietly and do whatever was asked, thinking I was going to pass out from oxygen deprivation or hyperventilation, but he always pressed me just to the point I thought I couldn’t achieve and right before I’d pass out he’d let me stop! Nick got me to do more than I thought I could; more than I would have ever done on my own. Nick was positive and encouraging. Always ready with a bright, friendly smile. He took me where I was – didn’t make me feel ashamed for letting my body get in the situation it was in and looked at the facts and asked me where I wanted to be in 6 months or 12 or 24! Initially I wanted to be able to enjoy life with my family. I wanted to lose some weight to feel comfortable again. I wanted to be alive for my future grandkids and be able to get down on the floor to play with them and be able to get back up again afterward too! Seriously. Once down on the floor, I couldn’t get up again by myself! That’s how weak I was! I progressed ever so gradually, but Nick was always ready with praise for even the smallest increase of strength. I’d downplay it because of embarrassment and he’d remind me how far I’d actually come. No progress was too small to celebrate. I’ve gone back and reread several of my blog posts about working out at Fitness Together and was reminded of just how monumental my progress actually was. I remember telling Nick that I was out walking with my husband up a hill and I could feel a shift. All of a sudden I could breathe deeply, all the way in. I could fill my lungs and it was the best feeling ever! It was the first time in 3 or 4 years that I could completely fill my lungs with air! I’m not sure, but I think I may be the only person who would ever leave a workout with Nick by thanking him. But I did. Yes, I paid him to work with me and it wasn’t cheap, but I still thanked him for making me a better, stronger, healthier, happier me. He’d tell me I was the one doing the work, but I wouldn’t have been able to do it without him. Nick and I would discuss things I’d blog about relating to weight loss, fitness or nutrition. He’d challenge my thinking and press me to see a different perspective. I know I’m just me, not a great person in the whole scheme of things, but I’m sure if you asked others, they’d feel the same way: Nick was a person who won a victory for me. 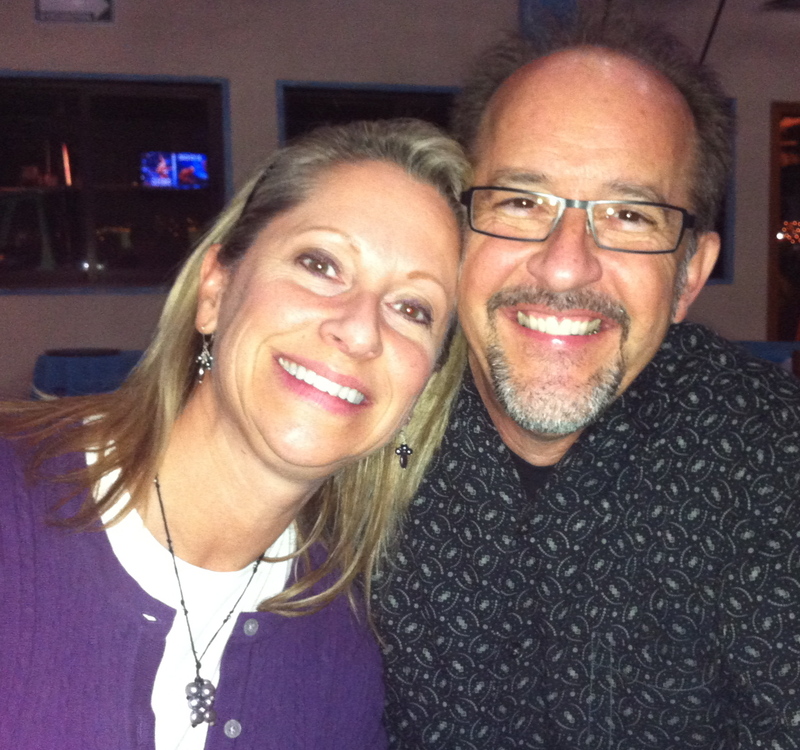 He helped me conquer the ravaging effects of cancer in my body to become stronger, healthier and happier. His death is untimely for sure, but there is no shame in it. Nick won a huge victory for me by helping me find my way back to myself, back to even a better place of health and wellness than I ever thought I could. Nick, I’ll do my best to carry on your legacy of winning some victory for humanity in my world. I’ll miss you, but I’ll do you proud. I was talking with my husband the other day after reading my Barbie post to him. We got to laughing and came up with a list of silly reasons why I can be glad I work out, even if I never get the Barbie-results I long for. So here, my friends, is a partial list of reasons I’m glad I workout. I won’t need to rely on a “Help Rescue Necklace” when I fall. It’s not a matter of if, it’s only a matter of time! It’s a fact anyone in my family will tell you. I’ve got quite a bit of experience falling! I won’t have to howl into the carpet, “Help, I’ve fallen and I can’t get up!” Oh, I’ll fall down for sure, but I’ll be strong enough to at least get back up on my own, thankyouverymuch! My final point on this partial list of reasons I’m glad I work out is that I can have my cake and eat it too, at least some of it! You see, one of the reasons I work out is to eat. BTW, have you tried those dark chocolate-covered caramels with the coarse-ground sea salt on the top?! Ohmygosh! If eating them was the only reason I worked out, it would be worth it! I’ve watched skinny girls all my life. The saying was and may still be, if you want to be skinny, watch a skinny woman eat [and imitate her.] Um, helloooooooo, is anyone paying attention? Skinny women don’t eat! I mean, hardly at all! I’m so sure. That, my friends, is the reason I’m not skinny. Life is too short not to enjoy eating. So, when I get discouraged that I’m not seeing the kind of progress I desire, I will return to this, my list of laughable reasons why I’m glad I work out. I’ll smile that I don’t have an arm waddle; I’ll be happy knowing that I shall never break my hip, and that when I fall, I’ll be able to get myself back up again without a medical team. Then I will go find one of those yummy dark caramels with the chunky sea salt bits on the top and chew and savor it as my mouth waters in delight from the creamy, sweet-saltiness that those skinny girls have only ever dreamed about! Today I had my third “test” at Fitness Together. Pretty painless if you don’t count stepping on the scale and getting calipered to see my fat percentage! The first time I had these things done was at the very beginning to get a ‘base line’ so it would be easy to track my improvement. I was mortified! The second time I wasn’t horrified because I knew I’d made significant strides. Well, this time I wasn’t mortified or horrified, but I wasn’t exactly ecstatic. I felt disappointment when I stepped on the scale and when he pulled out those calipers, felt fear of finding out the fat facts! But before all that, Nick and I discussed how things have been going and I shared with him I feel like I’ve kind of stalled. I fessed up about how I’ve been buying my favorite (one of many) Easter treats, the candy coated malted milk eggs! I ‘only eat a serving’ but then maybe another one later in the day! It’s fine and dandy to eat candy, if you aren’t trying to lose weight! Duh! My calories need to count for nutrition and satiety. If my stomach doesn’t fill up, I’ll eat more, and that’s what’s been happening! I’ve been hungry hungry! Did I mention I’ve been hungry?! I also made a commitment to do a complete job of filling in my food chart every day instead of petering out after lunch and winging it the rest of the day/night. And, here’s my reward! Every week that I do the work, (taking my baby steps toward grown up athletic discipline!) I get to eat 4 of those amazing chocolate eggs! 4! I told Nick a serving is 5 eggs. He said, “I know, you told me.” I was like, well then, why not 5? He asked me if I always eat an entire serving of everything, for instance, a meal at a restaurant. I said of course I didn’t. Well then, point made! Why do I need to eat 5 when 4 will do? I want to lose another 20 pounds by the end of July. It’s possible, if I follow the plan and stick to it! So there are my goals: showing up early to do 2 training sessions, 3 additional cardio sessions, keeping a complete and accurate food chart, and then I’ll see the changes I long for. I read recently in a book, “Don’t let anything you can change limit your life.” This is powerful. As I look back over the years of feeling inferior because of many things, but mostly my appearance due to weight issues, I realize that I allowed something that I could change limit my activities and relationships! No more! I’m on the road to health and that includes emotional and spiritual health as well as physical well-being. They are all interwoven. There’s no separating them. Please allow me to encourage you to take those words to heart and make some decisions to change what you can change so that you don’t limit your living! It just so happens that this weekend, March 12th, there is a Wellness Seminar at Lifegate Church from 9-4:30. There will be some excellent speakers, and topics that should interest you. Also, there will be professionals there to screen your blood pressure, spine and vision, all for free! Check out the link and try to come. The sessions I’m particularly interested in are: Creating a Personalized Fitness Plan (taught by real trainers), Overcoming Obstacles to Exercise (taught by Sara Garcia, a Wellness Advocate and motivational speaker), and The ABC’s of Managing Stress (taught by a Dr. of Psychology)! There are many more topics, all taught by professionals with plenty of experience. So, come check it out! It’s free! Come and take your first step at making a change to expand your limits! See you there! I was at Fitness Together again yesterday. =) I go twice a week. I can’t tell you how grateful I am to be able to go! I feel so healthy and strong and after years of being sick, I feel like a brand new person! I no longer feel old and decrepit! Now that is worth shouting about! Personally, I gravitate to sitting and reading, sitting and writing, sitting and working on my computer, sitting in the backyard enjoying the beauty or standing to cook! I consider pushing a grocery cart up and down the isles and carrying the bags in the house to be a workout! Yesterday I was chatting with Deb at the dry cleaners about these things. She’s seen me change over the last year as I carry in dirty laundry and carry out freshly pressed shirts. She knows I’ve been a regular at Fitness Together just down the street, so she asked me how it’s been going. I shared my newest revelation of how it hasn’t gotten easy yet . . . and that it never will be easy, sigh. She’s a runner. She’s been running for years! She told me that there were times she was unmotivated or wasn’t feeling all that well, but that she would keep at it because she was afraid if she stopped, she might not start up again! That’s what kept her running! We have something in common! That’s part of why I keep going! I’m not afraid if I stop I’ll never start up again, I’m fairly certain that will happen! As I finished up my workout yesterday, Nick, as always, found the golden nugget of encouragement. He’s always so good at sifting through everything and seeing the improvement, the success, and pointing it out. He reminded me that even though I’d been extremely tired that morning (after flying in the night before – having taken 4 trips in 8 weeks!) that I showed up! That’s huge! He mentioned that I got out my food diary and started it up again, telling him about it so that I could be accountable. He said that is a great sign of change in my life. Monitoring my schedule, activity and eating and adjusting shows just how much I’ve learned over the last year. He’s always so good at reminding me of the monumental steps I’ve taken, baby steps for me, yet life-changing significant steps all the same. (One small step for woman, one giant leap for womankind?) My friend Deanna reminds me regularly from whence I’ve come. It’s easy for me to forget the pneumonia, the dizziness, the weak heart, weak lungs, the multiple surgeries and weak muscles from all of that. Easy, because I want to forget. She reminds me and gets choked up just thinking about where I was and where I am now. I may not be where I’d like to be. (But really, who ever is completely?) But, I’m not where I was, and I’m moving forward. That in itself is worth celebrating. Working out may never become easy, but Nick told me it shouldn’t. He said if it’s easy, then I’m not working myself hard enough. Why bother going through the motions but not gaining any benefit? Too many people settle for that. Workouts should be hard. So, as I keep at it, I need to celebrate the little things, like the progression I’ve taken. Hate working out – dislike working out – seeing the benefits of working out – not hating working out – looking forward to working out because I will enjoy the benefits. I still wouldn’t get there without having to make and keep an appointment. The accountability is what gets me there! But at least I show up, and that’s progress!